After thirteen months of intense negotiations, the United States, Mexico and Canada announced they had reached a new trade deal on September 30, 2018. The United States-Mexico-Canada Agreement, or USMCA, is set to replace the 25-year-old North American Free Trade Agreement. 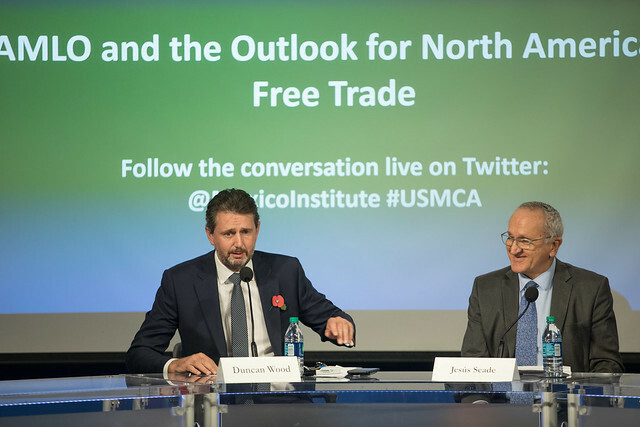 The Mexico Institute hosted Jesús Seade, Mexican President-elect Andrés Manuel López Obrador's chief NAFTA negotiator, for a conversation on the outlook for trade in North America under Mexico's new administration. Prior to his position as Chief NAFTA Negotiator, Jesus Seade was Vice-President of two leading universities in Hong Kong and China and was a member of the Advisory Board of the Ministers of Trade and Financial Services in Hong Kong. He is a former Ambassador to the General Agreement on Tariffs and Trade (GATT) and served as Deputy Director General of the World Trade Organization (WTO). He has also been a senior adviser to the International Monetary Fund (IMF), the World Bank, and the WTO in Geneva. Seade is the author of several influential publications on public finance, market structure, and international trade. He holds a Bacherlor's Degree in Chemical Engineering from the National Autonomous University of Mexico (UNAM) and a Ph.D. in Economics from the University of Oxford.